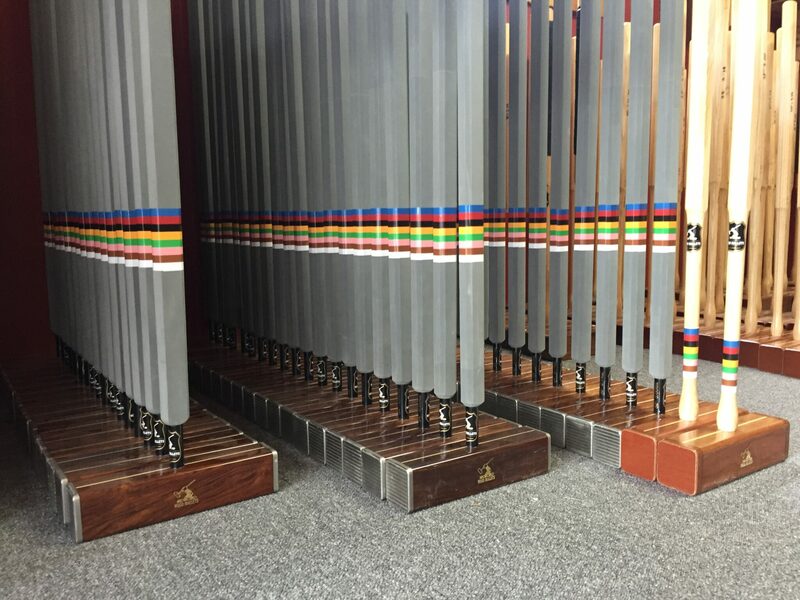 Length (Overall) Choose an option32"33"34"35"36"37"38"39"40"
Our mallets have evolved from several years sourcing the best possible materials and trialing different concepts and configurations. Milled stainless steel end plates provide peripheral weighting to an attractive Indian Kikar and poplar head measuring 55 mm wide by 60 mm high. 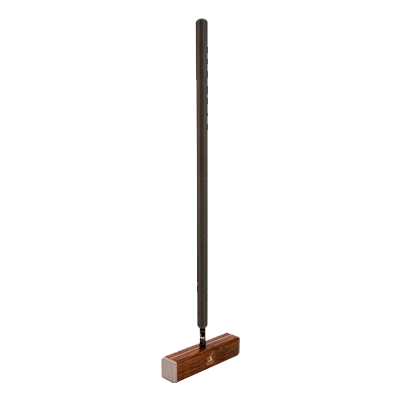 The standard head length is 10” in length but custom lengths are made to order at no extra charge. 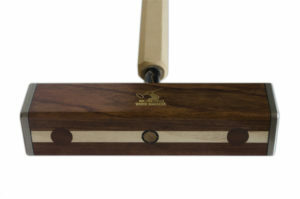 By using a lightweight poplar centre piece this acts as a very visible sighting line but also by having the heavier timber either side if the head adds a new dimension to peripheral weighting. For longer or lighter heads we use a wider central core. 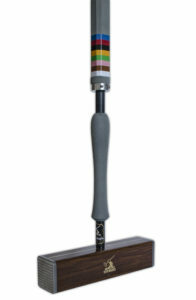 These are superbly balanced mallets that provide the player with more power and yet maintain better control. By increasing the length of the head, and re-distributing some of the mass close to the striking faces, the moment of inertia is increased. 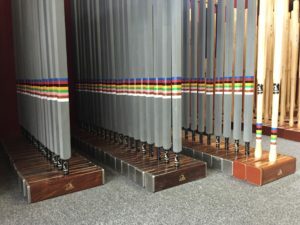 This makes the head more stable during the swing, particularly for making accurate rushes, long roquets, and hitting-in. 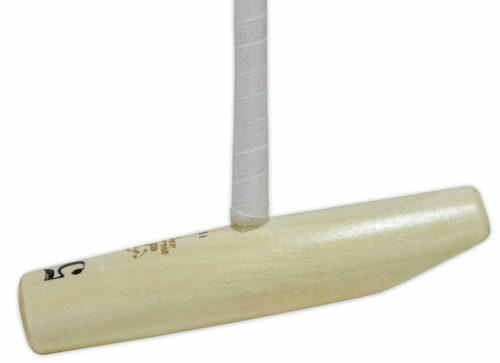 Also such a mallet turns less when shots are hit off-centre. 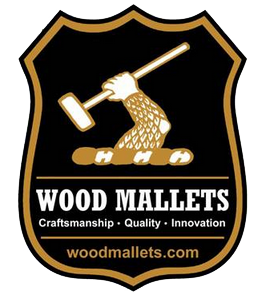 We only use imported hardwoods which are certified as being sourced from sustainably managed forests. The timber is air dried in block form for over a year. 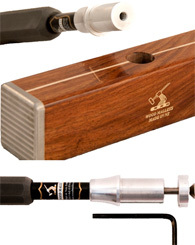 The white sighting line is made from the sapwood of poplar. 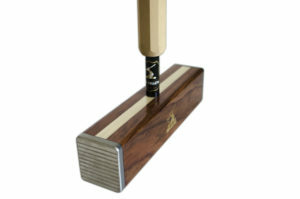 Horizontal milled lines on the hitting surface allow the player to impart spin on the ball when required. The virtually indestructible 17 mm diameter carbon and fibreglass shaft is foam filled to minimize vibrations and they weigh an average of just over 10 ounces. They’re made to a reasonably stiff flex unless otherwise requested. EVA is a closed cell foam grip material being waterproof, comfortable and light. Available in grey or beige. The EVA is specifically made in a 35 mm tubular form of relatively firm hardness and is then shaped by hand. 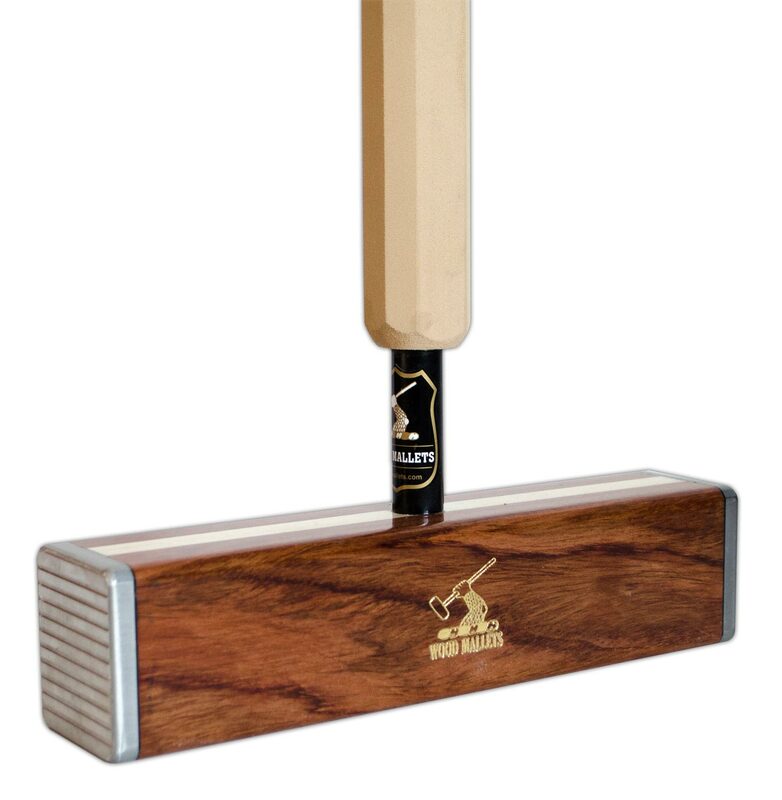 The standard is a traditional octagonal shape measuring 31 mm x 27 mm but this can be customized to suit the player. 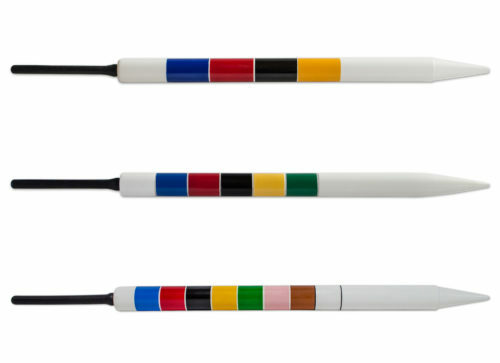 Another popular shape is the 35 mm round handle with flat sides as pictured on the right. 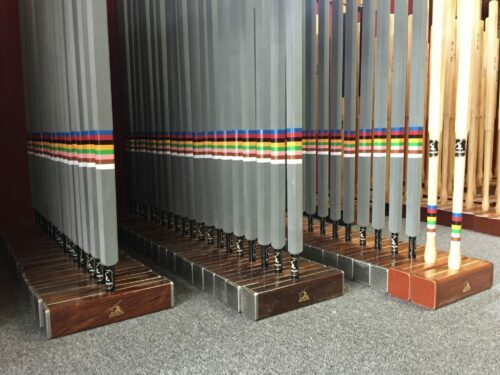 All mallets are supplied with medium stiff shafts although we can use a more flexible lively shaft if preferred. Unless specifically requested, the EVA comes to within 50 mm of the head, however, we can adjust this length as required. 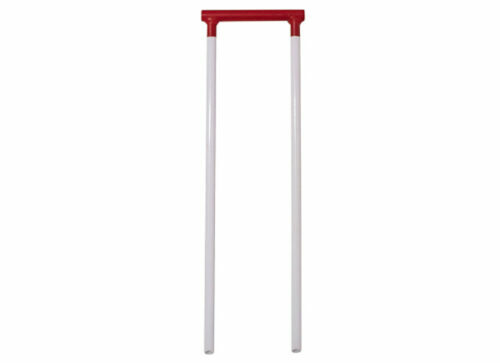 Handles can be supplied in any lengths up to 42″. 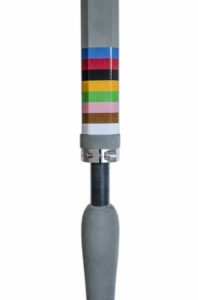 Now all handles come with a coloured band showing the order of play. To personalize the mallet, short names or initials may be stamped on the blank side of the mallet head in gold foil at no extra charge. Please note that we can only print in capitals at 36 pts as shown above. 10 letters is the maximum. If you prefer to have a name or letters printed in gold on a 12 or 18 mm black label (as pictured), please just mention it when ordering. The advantage of a label is that it’s removable if circumstances change. The length adjustment can be made up to 2″ up, or two inches down simply by using the alan key provided. When ordering, stipulate the middle length required. :Handles are available with aluminium fittings so that heads may be removed for travelling or switched for different specifications. Add NZ$70.00. This can be a useful option if the player wishes to switch heads or handles with other manufacturers components but the additional weight of the aluminium fittings is rather counter productive to the peripheral weighting. 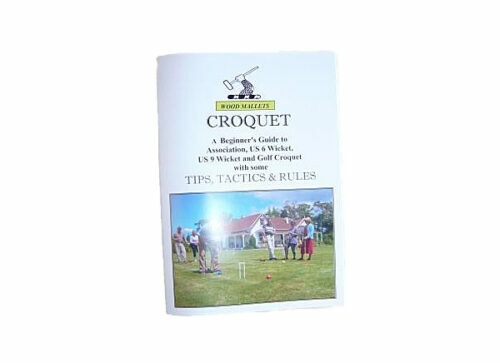 Download our croquet mallet brochure here.